An ambitious Chicago architect took Daniel Burnham’s admonition to make no small plans to heart and he planned for an 1893 World’s Fair building big enough to hold the whole thing! Geoffrey Baer has the story of an outrageous building that might have been in this week’s Ask Geoffrey. A few years ago I acquired a copy of a drawing depicting the interior of a proposed 1893 World’s Fair building that would have housed the entire fair. Is there a full-sized original or copy of the concept drawing of the proposed building anywhere in Chicago? Our viewer Ed is right – the structure that architect Edward S. Jenison proposed for the 1893 World’s Columbian Exposition would have had to be enormous to house the entire World’s Fair. Guess he really took Daniel Burnham’s admonition to make no small plans to heart. 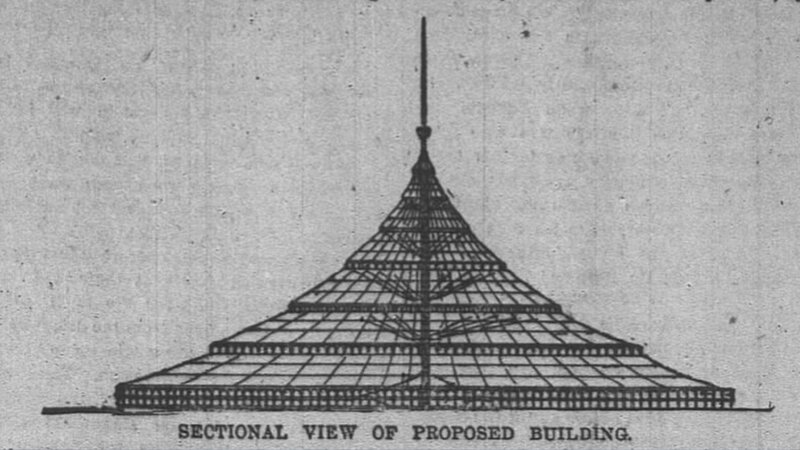 Jenison’s round, tent-like structure would have been 3,000 feet wide – that’s more than half a mile – with a center steel tower 1,100 feet high with an elevator leading to an observatory at the top. That’s only about 20 feet shorter than the Hancock Building! Cables radiating from the center mast to a three-story-high brick wall would support a glass and corrugated iron roof encompassing over 160 acres. An amphitheater around the center pole would have seated 500,000 people. And it wasn’t just the size and height that were ambitious. Jenison planned for the whole thing to be built not on land, but in the lake near the shoreline off Jackson Park and supported on submerged piles. Water would be drawn up through the central tower and distributed over the roof to keep the building cool. He also included plans for an interior canal for a naval exhibit and railroad exhibits running around the outer perimeter of the building. Chicago cultural historian Tim Samuelson was familiar with the plan. He describes it as a “pipe dream” that captured a lot of people’s imaginations when Jenison proposed it in the spring of 1890, when planning for the Fair was going on. Engineering experts questioned whether it was possible to build at all. Some said that in theory it could be, but others believed that the technology wasn’t there yet. George B. Post’s behemoth Manufacturers and Liberal Arts Building at the 1893 World’s Columbian Exposition. Ultimately, Jenison’s plan was jettisoned when it was decided to build the fair on land in Jackson Park rather than out in the lake. But the Columbian Exposition still managed to create the largest building in the world at the time: the behemoth Manufacturers and Liberal Arts Building, designed by George B. Post. What is the history of the Blackstone Library? It looks like a building from the World’s Fair. The Blackstone Library does look like the buildings that were built for the World’s Fair – not the futuristic glass dome that Jenison proposed, but rather a series of neo-classical buildings inspired by the architecture of ancient Greece and Rome. Blackstone Library is a stunning neo-classical building in white marble, but it was built in 1904, seven years after the Fair. It’s likely the architect Solon S. Bemen was inspired by the Fair’s architecture. This neo-classical style became all the rage nationwide after millions visited the Fair in 1893. It was called the City Beautiful movement. Isabel Blackstone built the library in memory of her husband Timothy, a railroad executive, first president of the Union Stock Yards and philanthropist who died in 1900. Timothy Blackstone had set aside money to build a library after his death as a gift to the city where he made his fortune. Its design is typical of the City Beautiful movement, with classically inspired columns and a central dome. Inside the impressive bronze doors, the ceiling of the 50-foot high dome is painted with murals by Oliver Dennet Grover that represent art, science, literature and labor. Marble floor mosaics shine beneath a leaded glass skylight, and in the stacks, the glass-floored mezzanine allows light to filter down to the floor below. The architect Bemen is most famous as designer of the industrial town of Pullman, now a Chicago South Side neighborhood and national monument. The Blackstone Library also has a special place in Chicago Public Library history. It was the city’s first branch library built to serve residents in their neighborhoods. Up until that point, books were delivered from the central library to reading rooms around the city, so this was where the library started coming to the residents. Today, the Chicago Public Library has 80 locations all over the city. And in case you’re wondering, the famed Blackstone Hotel and the former Blackstone Theater next door were also named for Timothy Blackstone – they were built on the site of his mansion.